The North Coast Rivers went to action stage, and in some cases minor flood stage, over the holiday weekend. As of this Monday rivers are still high and off color. Looking at the hydrograph it looks like they should be fishable, although still a little high, by the weekend. The Kilchis is always one of the first North Coast rivers to come back in shape, so it might be a good bet for later in the week. 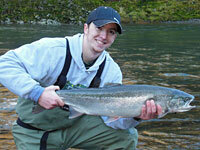 Most of the North Coast Rivers will start to wind down for fall Chinook toward the end of this month. However, the Kilchis is known for having some later fall Chinook, and it’s not uncommon to catch bright salmon well into December on this river. All of the usual techniques, such as bobber fishing, divers and bait, and back bouncing should be effective. Anglers are reminded that catch-and-release chum fishing is now closed.